There’s no secret to the way our tax system works: If you make money, you owe taxes. However, when the taxes have to be paid depends on whether it’s income from your job or from your investments. While you have to pay the taxes on the money you make from working every year, when it comes to real investment income you may not have to pay taxes at all – at least not right away if you’ve invested in real estate. If you are investing in real estate, then learning about the tax deferral options available through the IRS tax code section 1031 could protect your investment profits. You don’t need to be an expert on the code, but you should understand the basics and how it can benefit you. This section of the tax code covers income (gain) earned from selling investment real estate. When selling a rental property for a profit, taxes are due on any gain made while you owned it. Gain can be both profits from the property appreciating in value, or from depreciation deductions taken while holding the property. When investment property is sold, taxes are calculated by taking the property’s original purchase price, adding in any capital improvements and subtracting all the depreciation deducted while you owned it. Capital gains tax can take a large chunk of your investment profits. If you’ve owned the property for less than one year, the gain will be subject to short-term capital gains tax (the most expensive) and over one year it will be subject to long-term capital gains tax. So protect your profit by taking advantage of IRS code Section 103, commonly referred to as a 1031 Exchange. The 1031 Exchange allows you to defer taxes on any gains indefinitely, as long as you purchase another ‘like kind’ property to replace the one you sell, within a specified timeframe and cost structure. It’s critical that you follow all the conditions of this tax code exactly or you’ll owe the entire taxes due. 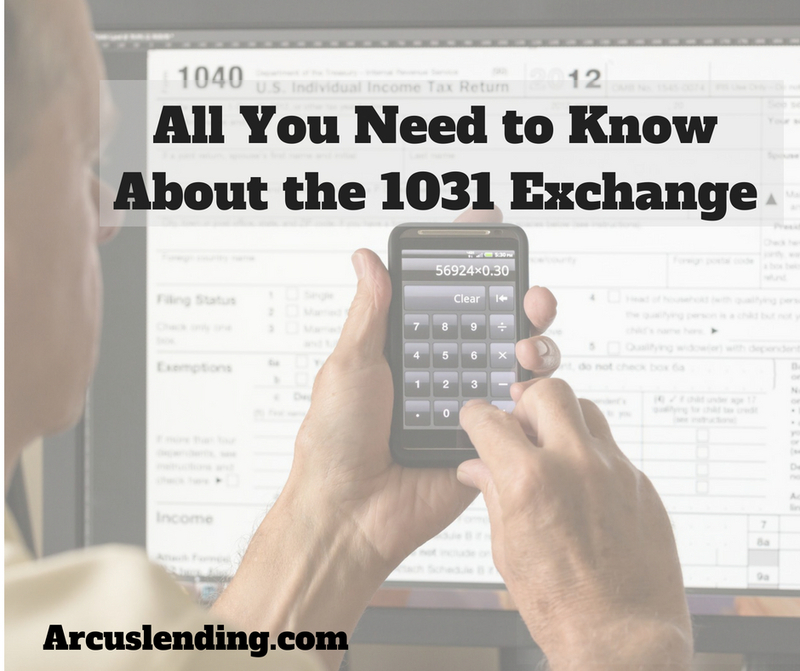 To qualify for the 1031 Tax Deferred Exchange, you need to structure the sale and purchase of the property correctly – or properties because it can be more than one on either end of the transaction. For instance, you need to pay attention to the exact timing allowed in the tax code, which gives you 45 days, from the date of closing on the sale of your investment property, to identify a property, or list of three properties, you may purchase to replace it. Also, once you close on the sale of your investment property, you have exactly 180 days to complete the purchase of one or more replacement properties from the list you created by day 45. Miss either of these deadlines and the capital gains tax will be due immediately. But those aren’t the only things you need to comply with to defer your taxes. The title holder on the replacement property(s) must be the same as the title holder on the property that was sold to qualify for the 1031 Exchange. You must also invest all the proceeds from the sale into the replacement property(s), but the replacement must be equal or greater in value to the property that was sold. If there was a mortgage on the property you sold, the new mortgage must be the same amount or higher as well. If the new property costs less than the one sold, or if the new mortgage is less, the difference is termed “boot,” and capital gains taxes will be calculated on the “boot” amount. Section 1031 also states that you can’t have control of the any of the proceeds from the sale of the old property. That means any associates, employees, your attorney, real estate agent, or accountant/CPA are prohibited from holding the proceeds. Also, the money can’t be left in an escrow account while you complete the replacement transaction. The law requires a Qualified Intermediary, also known as the 1031 Exchange Facilitator, hold the money. They help manage the transaction timing, complete necessary legal documents, and facilitate earnest money deposits from exchange proceeds for you. There is a lot of confusion about one part of Section 1031 – namely, what does the IRS mean by like-kind property? It doesn’t mean that selling a two-unit property must be replaced with another two-unit property, nor that a shopping center must be replaced by buying another shopping center. The definition of like-kind property is broader than the actual type of property. Like-kind property refers to how the investment property being sold was used – for instance as a rental property, or vacant land, or any property used for trade, business or investment. The replacement property must match the use of the property that’s sold in the exchange to qualify for the tax deferment. According to the IRS, real property and personal property can be eligible for the exchange, but real property can never be like-kind to personal property. The best advice to follow as a real estate investor is to work with an accountant or CPA to make sure you’re taking the right steps when buying and selling. And let me know if you’d like more information about how a mortgage will fit into your investment plans.